Recently, I was asked by a nearby art gallery* to teach a printmaking workshop, since my BFA major is printmaking. Mostly folks don’t really know what printmaking is. I didn’t until I took my first class. In a nutshell, printmaking is making a “plate” that can be used many times to print an image over and over. The simplest “plate” is a rubber stamp. In this workshop I showed participants how to carve an image into a rubber block, ink it, and print it. 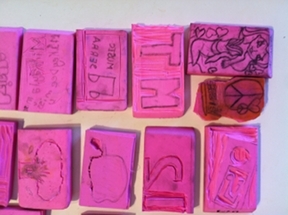 The stamps in the picture on the right were made by Grade 4 students. Stamps were printed several times each, including Artist Trading Cards, and a large poster of everyone’s stamp. “A” printmak ing workshop turned out to be 3 days of workshops. Students ranged in age from grade 1 to grade 12. Time varied from 1 – 2 hours, as well as an adult class that was all day. Time between classes was sometimes non-existent. Ahhhhhhh. The hardest thing for me, was preparing materials because it changed for each group, especially because the youngest group didn’t use sharp carving tools. To say the least it took considerable effort to prepare for! The highlights of the workshops were seeing sparks of inspiration. It made the hard work worth it. I fanned those sparks into flames as often and as hard as I could. Mostly, I loved being asked repeatedly where to buy these materials, and I loved that they wanted to keep working even when it was time for them to go. I thought I’d prepared for every possible scenario though, until I set out to teach my daughter’s grade 4 class. As I was leaving home, my daughter phoned to say she wouldn’t be meeting me at the school after all, since she was going into labour! It made for a very interesting couple of classes! Her students were darlings who clamoured to know about their teacher and the baby that was coming soon. My daughter made her own stamp on the world with a big beautiful baby boy who was healthy and perfect. And her students felt like they somehow shared the experience because their teacher’s mom was with them while she had the baby. Their excitement was fantastic!! 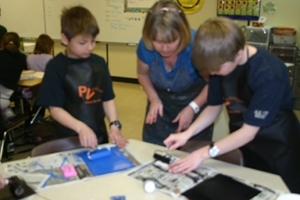 Besides the excite ment of a new baby, and making stamps, our workshops were sponsored by PV Disposal who also gave each of the kids an apron to keep the ink off their good clothes. They were almost as happy with the aprons as they were with their new rubber stamps. Even though we used brayers and printer’s ink in the workshop, at home they can use their stamps over and over again using a simple stamp pad. I’m pretty sure more than a few will go out and get supplies to make more stamps at home. My job here is done! In my next blog entry I will describe how to make a rubber stamp in 6 easy steps. This entry was posted in Family, printmaking, workshop and tagged block prints, printmaking, relief blocks, Workshop by artmyth. Bookmark the permalink.